Welcome to the Johns Hopkins Surgical Pathology Unknown Conference site. As part of the anatomic pathology training at the Johns Hopkins Hospital Department of Pathology, 6-8 unknown surgical pathology cases per week are given to residents. These cases often comprise both classic and unusual lesions seen in surgical pathology during the preceding week. As the residents consider this one of the finest conferences in our department there has been considerable interest in providing it to practicing pathologists using the Internet. The original idea of placing the “Surgical Pathology Unknown Conference” on the Internet was that of Mark Silberman, M.D. in 1996. 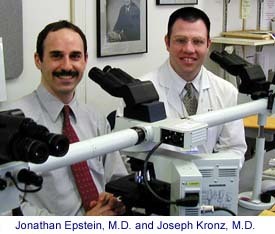 The current web-site was conceived and developed under the direction of Joseph Kronz, M.D., Chief Resident, 1999-2000 and Jonathan Epstein, M.D., Professor of Pathology, Oncology and Urology. Cases for each week’s conference are compiled by the surgical pathology attendings and pathology residents who are named in each case description.